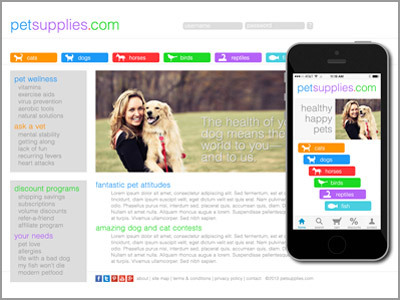 PetSupplies.com needed a redesign. As an exercise, we created a new site. We did the site redesign, as well as the logo re-design. Click through to see before and after the redesign (http://greenergrassmedia NULL.com/wp-content/uploads/2013/10/pet-supplies-before-and-after NULL.jpg). If your browser does not display the new site large enough, here’s a screen shot of the new PetSupplies.com site by itself (http://greenergrassmedia NULL.com/wp-content/uploads/2013/10/petsupplies NULL.com NULL.jpg). We do wireframes (http://greenergrassmedia NULL.com/the-importance-of-wireframes/ ) too. Every website needs to be adapted for viewing on smartphones and tablets. This adaptation does not happen automatically. Every element must be carefully chosen to allow the mobile site to keep the necessary functions and yet work within the smaller environment. A good mobile website design carries the visual feel of an organization’s main website. 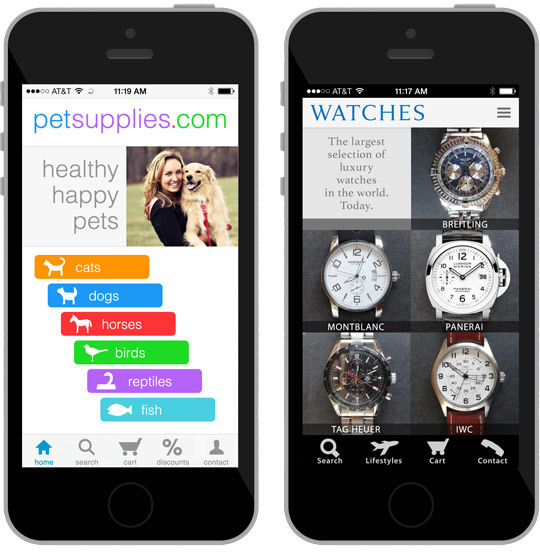 The PetSupplies.com and Watches.com mobile websites shown below are both design exercises.